President Nana Addo Dankwa Akufo-Addo on Friday urged Ghanaians especially the academia to strive to carry the torch Professor Francis Allotey lit in the study of Mathematics and Physics. He said the country would witness the progress it yearns for in the 21st century if the study of science and technology is made a living reality. In a tribute to the late Professor read on his behalf at the pre-state burial service, at the forecourt of the State House, President Akufo-Addo called for the training of many young people in the mode of the late Prof. Allotey. 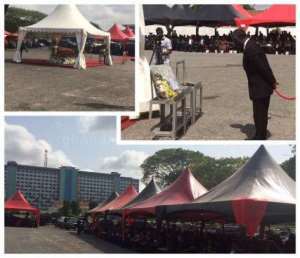 Prof Allotey would be buried on Saturday at his hometown, Saltpond. 'It was one of the wish of the late Saltpond boy that many people will embrace the study of Mathematics and Science education, as a result, he always inspired young people to take to the learning of Mathematics and Science,' he said. President Akufo-Addo described the late Prof. Allotey as a patriotic citizen and a great scientist, whose knowledge and service was sought after throughout the whole world. 'He could have offered his services to other countries for higher financial gains but he chose country over gain. If we were to do a list of persons for a science and technology hall of fame, there will be no doubt in anybody's mind that Prof. Allotey will make it to the top of that list,' he said. To demystify the learning of Science and Mathematics, President Akufo-Addo said Prof. Allotey led the establishment of an African Institute of Mathematical Sciences, which had become a centre of excellence with the teaching and learning of Mathematics in West Africa. On his achievements, he said the late renowned scientist's Formalism theory and many other pioneering monuments that dotted the academic landscape of our country and indeed the world would continue to stand to his eternal memory and glory. 'Prof. Allotey's exploits in Science and Mathematics, led to the establishment of the Laser Research Unit in the Physics Department of the University of Cape Coast, which is projected as a center of excellence to serving the whole of West Africa is a testimony to this belief,' he said. Emeritus Prof. Albert K Fiadjo, Fellow of the Ghana Academy of Arts and Sciences said the late Prof. Allotey was the first African to study at the Mathematics Department of Princeton University. He said, while in Princeton studying Mathematical Physics for his doctorate degree, Prof Allotey developed the universally acclaimed and world renowned, Allotey Formalism Theory. He explained that through intrepid research and complicated mathematical calculations, Prof. Allotey was able to prove that electrons jump into nucleus only after the nucleus has had an effect called 'resonance scattering' on it. Prof. Allotey was the pioneer in Computer Science Education at the Kwame Nkrumah University of Science and Technology (KNUST), first Ghanaian Full Professor in Mathematics at the KNUST. Chaired the Ghana Atomic Energy Commission on seven different occasions and a member of the United Nations Secretary General's Group of 12 Experts, which advise on nuclear weapons, a member of the Scientific Council of the world renowned International Centre for Theoretical Physics in Trieste, Italy, and Founder of AIMS in Ghana, among other brilliant accomplishments. 'Prof Allotey both symbolised and nurtured the maturing of science, especially Mathematics in Ghana. Through his enterprise and hard work, transformed the scientific landscape of Ghana, Africa and the world for the better. 'His singular role in the development and promotion of Mathematical Sciences in Africa is exemplified in the establishment of the African Institute of Mathematical Sciences (AIMS) (with that imposing and magnificent mountaintop edifice in Biriwa, near Salptond). 'His legacy to Ghana and the world through his line mathematical mind is monumental and our individual and collective debt to him is unusually large. The Most Reverend Charles Gabriel Palmer-Buckle, the Metropolitan Archbishop of Accra in a homily urged all and sundry to lead an exemplary life and never lose touch with the ordinary person. 'He had a sense of fair play, honesty, sympathy for the underdog, never allowed his supreme knowledge of his subject discipline and exhibited humility,' he added. Prof Allotey passed at aged 85, on the night of November 2, 2017. The renowned Professor was survived by four children and 20 grandchildren. Ghana's most accomplished scientist was born on 9th August 1932, at Saltpond. He became a world authority and an instant fame with his work on Soft X-Ray Spectroscopy, which established the principle widely known as the "Allotey Formalism" for which he received the Prince Philip Gold Medal Award in 1973. From 1997-89, Prof Allotey was the King-Chavez-Parks Visiting Professor of Physics at Michigan State University in the USA. For Africa, he founded the African Institute of Mathematical Science (AIMS), which he was its President. He was also a member of the Executive Secretariat Responsible for Sensitising African Leaders on Modern Technology for development. Prof Allotey, who was a founding fellow of the African Academy of Sciences, in 1974, became the first Ghanaian full professor of Mathematics and Head of the Department of Mathematics at the Kwame Nkrumah University of Science and Technology. He was also the President of the Ghana Academy of Arts and Sciences and a member of a number of international scientific organisations including the International Institute of Theoretical and Applied Physics (ICTP) Scientific Council from 1996. He was the Chairman of Board of Trustees of the Accra Institute of Technology (AIT), and a former Board Chairman of both the Ghana Atomic Energy Commission and the Council for Scientific and Industrial Research. Prof Allotey also did a lot of work for the United Nations Education and Scientific Commission and many international bodies. As the Founder and First Director of the KNUST Computer Centre, he was the first to introduce computer education into Ghana. The Faculty Board between 1971 and 1980 elected him four times as the Dean of the Faculty of Science. During this same period, he was elected five times as a Representative of the Academic Staff. He was ultimately appointed as the Pro-Vice Chancellor of the University in 1978. He was a staunch advocate for the socio-economic development of his 'beloved' Saltpond.